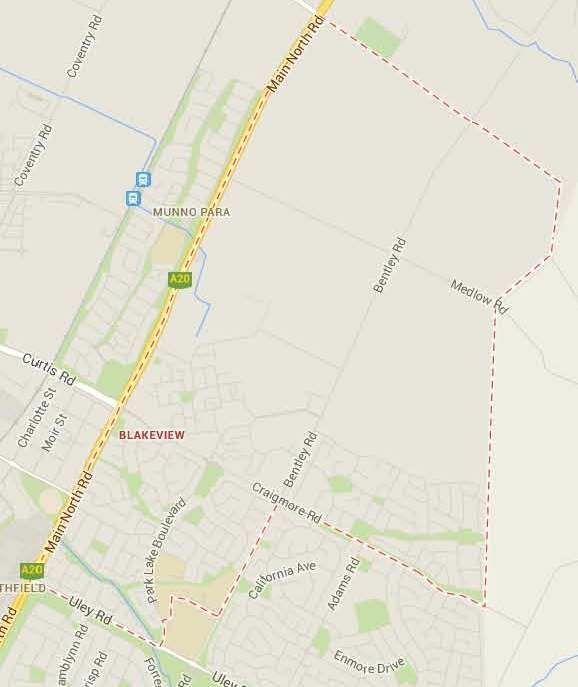 Blakeview is bounded by Smith Road in the north, the Adams Road alignment and a line running south to Craigmore Road in the east, Craigmore Road, the Bentley Road-Hanson Road alignment, a line to the north and west of Craigmore High School and Uley Road in the south, and Main North Road in the west. Joseph Blake, an early blacksmith in the area is where the name of the suburb originated from. Blakeview is a rural and developing residential area. The suburb consists of two schools and includes Lynay Community Centre. The median age of people in Blakeview is 30 years with children between the ages of 0 and 14 making up 25.5% of the population, and people aged 65 years and over making up 6.6%. Of occupied private dwellings in Blakeview, 98.6% are separate houses, 1.4% are semi-detached, row or terrace houses, townhouses etc., and the suburb consists of no flats, units, apartments or other dwellings. Out of these properties, 17.4% are owned outright, 56.3% are owned with a mortgage and 24.5% are rented.